The film looked fantastic in this format but to be perfectly honest it was no better than the standard Blu-ray version. All the visuals looked nice and crisp but comparing them to the Blu-ray it was pretty much the same quality. There isn’t anything bad nor is there anything extravagant either which is a bit disappointing when it comes to a 4K Ultra HD release. So if you have a few extra dollars to spend then get the 4K and it will cover all bases but if you buy the Blu-ray then you’ll be good to go as well. 3 Mini-Movies – 3 fantastic shorts that will keep you laughing the entire time. This reminds me so much of the “hayday” of cartoons. The Making of the Mini-Movies – The filmmakers talk a bit about creating these shorts. 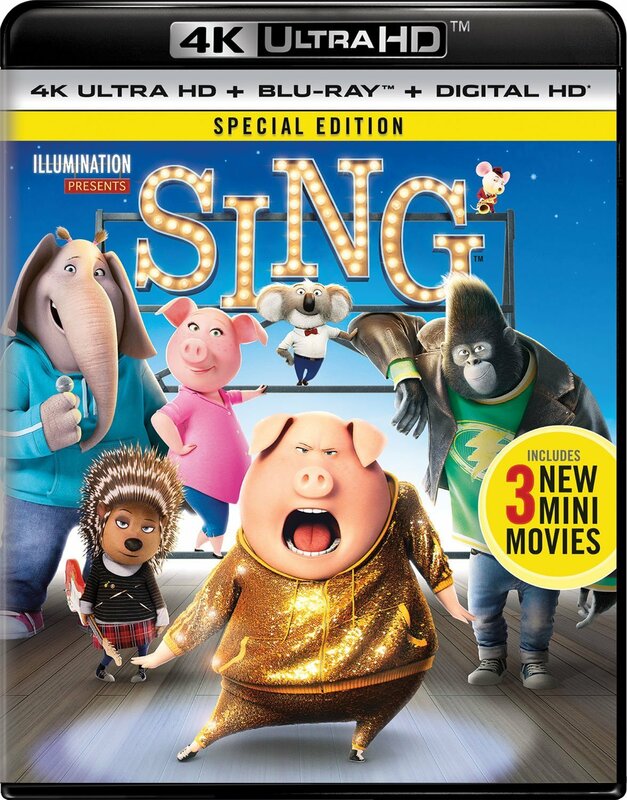 The Making of Sing – A look at the all around creation of the movie. This short feature goes through everything from the characters, script and animation process. Finding the Rhythm: Editing Sing – An even quicker look at the editing process of the film. Character Profiles – Really fast looks at the characters of the film and the voice actors that portray them. The Sing Network – This five part feature looks at a group of TV-like ads for various character businesses the film. The Best of Gunter – A nice little montage of funny moments from the character. Sing & Dance! – “Faith” – A number of dancers show various dance moves and how to recreate them. This entry was posted	on Tuesday, March 28th, 2017 at 9:37 am	and is filed under Reviews. You can follow any responses to this entry through the RSS 2.0 feed. You can leave a response, or trackback from your own site.